﻿ Got the Nerve? , Why? We get out in the community and show people of all abilities the potential to lead an active lifestyle. Disabled and able-bodied, we all have challenges but it is the goal of the IM ABLE Foundation to demonstrate it doesn’t have to be a limiting factor. Founder Chris Kaag does speaking engagements to show that regardless of his wheelchair he maintains an active and fulfilling life. 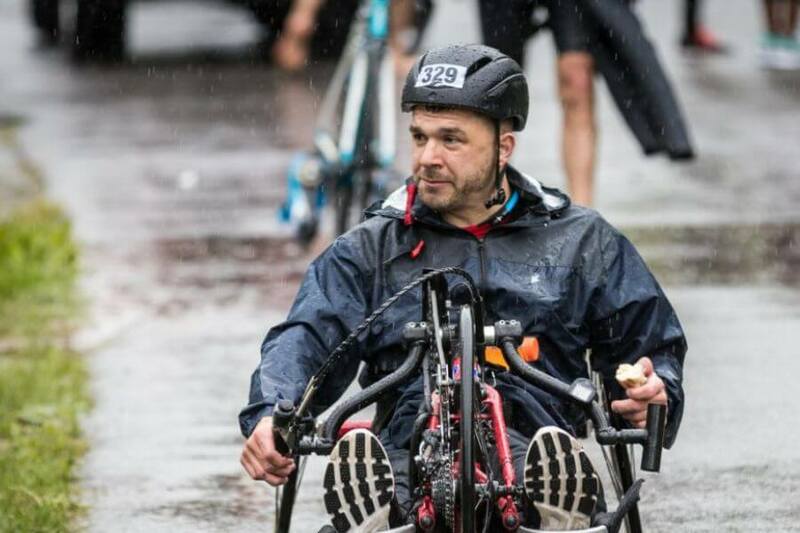 Handcycling, working out at his gym, Corps Fitness, and kayaking are all examples of how he is doing what he promotes…getting up and moving. Through these actions individuals will hopefully look at themselves and ask why they make excuses as to why they’re not active. Headquartered in Wyomissing, PA we “help where we live” but have expanded to outside the area when we come across programs that mirror our philosophy in helping individuals of all ages and abilities. A single handcycle can cost anywhere from $1,200 to $10,000. On average, a mono ski will cost around $3,600. The cost of a basketball chair ranges from $1,500 to $5,000. Cindy is from Lancaster, PA, and came to IM ABLE through a recommendation from her physical therapist. Cindy contracted polio as an infant and has always walked with leg braces and forearm or underarm crutches. Until recently, Cindy was able to walk to stay active. In the past few years, Cindy’s polio symptoms have worsened, and she has endured four surgeries to her hands and back. She and her husband began researching fitness options, but none seemed to be a good fit. Cindy came to us and tested a handcycle and was amazed at what a great workout it was. She is really excited to be able to ride a bike with her husband for the first time ever! We are proud to present Cindy with an Intrepid handcycle. Tim is a complete T-11 paraplegic as a result of a car accident when he was 17. Tim, who is from Yardley, PA, has maintained an active lifestyle through boating, quad riding and skiing, but he had always wanted to add a handcycle to his activities. Due to the medical costs not only for Tim, but also for his twin daughters who were born prematurely, he approached the foundation after meeting Chris at Magee Rehab in Philadelphia during the Ekso training process. We are excited to present a handcycle to Tim and know he will use it to stay active with his young daughters. At the age of 25, Chris Utz from Pasadena, MD, was involved in a car accident which left him paralyzed from the waist down. Prior to his accident, Chris was active in biking, boating, and other water sports and led a busy life running his own business. Chris’ medical bills forced him to sell everything including his business to cover the costs. Chris contacted the foundation about obtaining a handcycle that would help him improve both his physical and mental well-being. He is very excited to receive his new Top End Force Handcycle! Russell is from Landsale, PA and came to the foundation through a suggestion from his physical therapist. Russell sustained an L1 vertebra burst fracture as the result of an automobile accident in 2011. He is considered to be an “incomplete” paraplegic with some recovery. Russell started participating in an adaptive bicycling program through the Pennsylvania Center for Adapted Sports and decided to submit a grant request to IM ABLE for a bike of his own. While he is considering racing in the future, he is currently excited about the opportunity to get some exercise and to have fun doing it. IM ABLE is proud to present Russell with a Force 2 Handcycle. Chris did last year was probably one of the most memorable and impactful he has done because of the sincerest smile from Jeleni and his brother when they got the opportunity to ride their new bike attachment. The shear joy of that day is the reason why we do what we do. Change people’s lives and show them the possibilities. Friendship Community had some great words when they presented Chris with the painting: The residents of Friendship Community have an incredible range of skills. They participate in Special Olympics, they sing…their lives are active and vibrant. Society often misunderstands this or completely overlooks these skills. But not the IM ABLE Foundation. You see the capabilities everyone has no matter what! Jeleni wanted to bicycle to the heART of Friendship Gallery where he paints. You made that possible with the bike attachment. Today, we want to say Thank You for seeing the capabilities in us, and for making an impact in the world around us. An incredible day was had by all who came out to Whitetail ski resort in Mercersburg, PA. Two past grant recipients, Jessica Rogers and Ryan Frederick, mono skied for the first time and did remarkably well. IM ABLE granted Scot Seiss a new ski to replace his older and worn out ski and showed us how he is utilizing his new rig to the fullest! Many thanks to Bill Dietrich and the staff of Two Top Adaptive for their help with our new skiers and for being as excited as we are when it comes to helping people realize what is possible. In all of our lives we can find strength and determination by witnessing the lives and stories of others who do great things despite their challenges. This section is dedicated to all those who inspire us by their actions and it serves as an awakening to us all to look deeper inside ourselves and find the strength to overcome our own obstacles. If you know someone who is having a tough time, please share this with them to provide some encouragement. All of us at one time or another have faced challenges. Some are bigger than others and when we are faced with these challenges we draw strength from knowing there are others out there that have picked themselves up and have continued to lead the life they choose. Please share the story of yourself or someone you know who has been there and has overcome and inspires those around them with his or her determination. Your story can help someone who is not sure how to take that next step and just might be able to help them take it. Please submit your story using the email address below. Include a detailed description of your story, photos, and contact information.